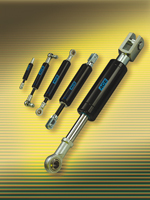 The hydraulic damping cylinders of the HB series are adjusted prior to assembly by turning the piston rod in its end position. The adjustment setting and the corresponding speed remain constant throughout the operation. These damping cylinders are available in four styles: damping, in both directions, in tension, in compression or damping through a fixed non adjustable orifice.